Jogging, an increasingly popular exercise is one of the best ways to achieve and maintain good health. It blends well with most lifestyles and routine and is perhaps the easiest and cheapest way to stay fit. Despite so much going for it, many of us are reluctant to put on our running shoes. Jogging can be incredibly boring – the same distance, pace and speed on the same track every day – it is pretty much mundane running and nothing else. Hence, it’s not surprising the passion for running every day fizzles out. People become less captivated with this lacklustre schedule and stop jogging out of sheer boredom. The good news is that with a little effort you can add excitement and look forward eagerly to your daily run. These five ways will inspire you to keep running. Jogging in silence is tedious, especially for a beginner. A playlist of your cherished tracks or listening to your favourite podcast can quell the boredom and put you in a positive frame of mind. Music is a great motivator. It has the potential to increase the enjoyment and raise the endurance of the workout a notch or two. If you follow a track with any traffic, be sure to lower the volume so you can hear any approaching vehicle. 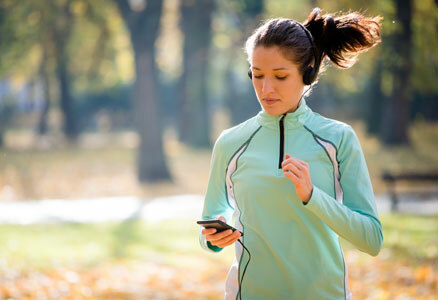 If you prefer jogging with music, it is best to use headphones or earplugs specially designed to be worn during workouts. Jogging at a stretch at one pace can get a trifle dull and dreary. To break the monotony, throw in some sprints. After a routine warm up, run for a few minutes, follow it up with a slower sprint before resuming the fast run. Time flies when trying to concentrate on the sequence of high and low-intensity segments. It eliminates staleness, helps retain focus and enhances the jogging experience. The repetitive motion of running on the same track can be downright monotonous which hampers the zeal. Freshen up your jogging routine by changing the normal route. Go off-road into the wilderness, or visit the community park. Simple things like dodging trees in the woods and running in the lap of nature are exhilarating and helps shake things up. However, make sure that you have the proper gear equipped. Wear appropriate footwear and carry any necessary safety equipment when jogging in the wilderness. If jogging is becoming drab, inject a dose of excitement by incorporating other exercises into the regime. Just alternate running with workouts like squats, push-ups, crunches, lunges and stretches. The addition of variety will generate excitement and provide better workout for your muscles. In addition to the above, getting a jogging partner can keep things interesting. Convince a friend or your significant other to join you. Even if you don’t talk while you run, a partner can keep you motivated when you slack.